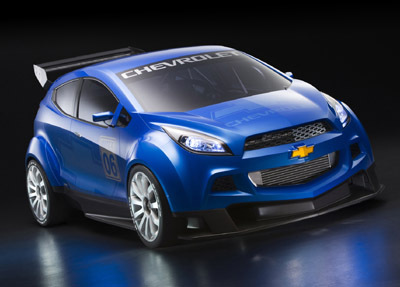 The Chevrolet WTCC Ultra concept from the 2006 Paris Motor Show is a bold, almost cartoonish, vision of a next-generation touring car racer. The WTCC Ultra is powered by a 2 litre turbocharged diesel developing 190 horsepower. 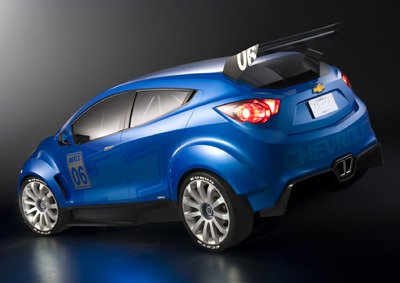 To keep the unladen weight as low as possible, the designers of the Chevrolet WTCC Ultra have made plenty of use of modern lightweight materials. The body parts are finished in "Stealth Blue", a further development of the familiar Chevrolet blue, and are made of a glass fibre and carbon fibre laminate. The flat underbody of the fully functioning Chevrolet WTCC Ultra touring concept car, which also graphically divides up the vehicle because of its dark colour, and the front and rear spoilers are made of a plain weave carbon fibre composite. The window frames and the air inlet grilles at the front are finished in semi gloss dark grey. They make an attractive contrast with the glossy silver-painted wheels and the polished aluminium door handles, number plate and centrally positioned tailpipes. Another aerodynamic feature apart from the flat underbody and the spoilers of the Chevrolet WTCC Ultra is a rear diffuser to create additional downforce. For better weight distribution, the WTCC Ultra's driver is situated as far back and as low as possible. 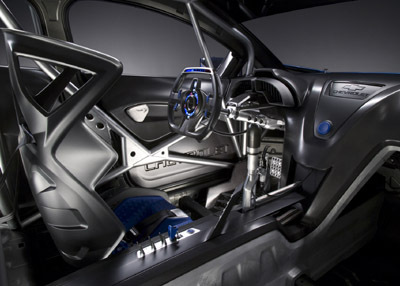 All the control surfaces of the car are designed to be exactly where the driver requires, from the steering wheel and sequential gear selector, to the adjustable pedalbox and the console-mounted electrical switches. The inner door releases in the front doors are also situated further back than usual to be in reach of the driver. The steering wheel is similarly rear-ward of normal, and houses all the technical information readouts for the driver in two screens. The main circular screen displays the gear selection and tachometer, as well as oil and water temperatures, fuel and oil levels, and brake bias. Four push buttons on the wheel control the functions of the main screen.